When my friend Catherine and I took a night walk around London Bridge in January, our original plan had been to then hop on a boat to the West End to shoot there too. Ultimately, the photographic opportunities in our first location combined with the freezing conditions of a mid-January evening meant we shelved that idea, and agreed in the post-walk debrief that we’d save that idea and return to it a bit later on. After getting some decent results with my 50mm f/1.4 on our previous walk, we both decided to shoot exclusively using our 50mm primes (Catherine has the Nifty Fifty). Catherine, however, had the foresight to make that decision before leaving home, so she could travel light. I still came prepared for anything, with my large camera bag full of kit and my tripod. Yeah, I’m pretty dumb. We ended up covering quite a few miles on our walk (our respective pedometers estimated we’d each covered 11 miles throughout our whole day) and by the time I got home afterwards I could barely move my upper body. We started our walk on the South Bank. Unlike our first walk, which was in deep winter and very cold and dark, the day of our walk was on the tail end of a lovely and sunny but chilly spring day, and it started right around golden hour, the time when the sun is low in the sky, giving everything a golden glow. I’d like to pretend that was something we had deliberately planned. We started on the bookstalls under Waterloo Bridge. As you’d expect, I shot wide open at f/1.4 – I love shallow depths of field. I’d learnt while playing with the lens on human subjects previously that at that wide an aperture it’s easy to miss the focus, and this was something I was keen to get right this time. Even fore non-moving things, too much movement of the camera could result in the subject drifting out of focus if it moves after focus lock-on. For things like lines of books, of course, it doesn’t really matter which book you’re focussed on. As it happens, completely coincidentally one of the books in focus was by someone sharing my surname. The bigger challenge came when photographing people. As ever, I was trying to be reasonably surreptitious (I’m 6’5″ with long hair, a goatee and a giant red camera bag… I blend in like a baboon’s arse). The problem with shooting people is, they don’t often stay still, so you need to fire the shutter as soon as you lock on, before they have a chance to move. Also, depending on the metering mode you’re using, you should be using an autofocus point that’s on their face (preferably their eyes), and not just using the centre point and then reframing (which, admittedly, is what I do all of the time… including on this walk. These are things I’ve retroactively remembered). Despite not following my own advice (that I hadn’t given yet), I got some pretty good results photographing the patrons around the stalls. Before we moved on, I took a shot of the underside of Waterloo Bridge itself. I put it through Color Efex Pro to enhance the feeling of desolation and decay, whilst still leaving a hint of colour in the graffiti. A little further down the South Bank we came across a busker. Despite doing a pretty good impression of David Gray, he was largely being ignored. I took a few shots of him but since there was only me (Catherine was a bit further along) I felt too self-conscious to try taking too many shots. We continued along, and I grabbed a few shots of the people on the South Bank, including this chap having either a late lunch or an early dinner. There was one weird moment when we both came across a huge flagpole. Neither of us had seen it before. We assumed it had been put in recently alongside the renovation of the nearby Jubilee Gardens. That is, until we found a plaque. It was apparently installed in 1977. Still, it looked nice with the fantastic sky we had. The golden hour light had begun to transition into an actual sunset. There were a lot of clouds around, and this made for some great sights. Time for some bracketed exposures. 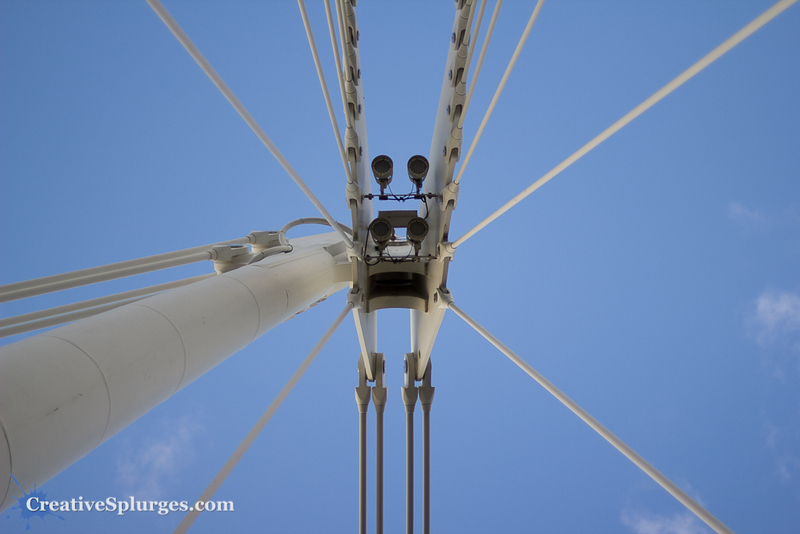 We headed up to onto the Hungerford bridge to cross the river. It was reasonably busy, giving another great opportunity to get some shots of the people using it. Unfortunately, tourists don’t always liked being photographed, so they didn’t often look that happy. By this point, the sunset in progress had turned very dramatic. In fact, I even decided to not bother with the foreground and just photograph the sky. With our view from the bridge, we could look down on the tourists on boat tours as they passed under us. The woman partially obscured by the ‘lu’ in my watermark is staring right at me, which was a bit disconcerting to see when I was editing the images. Every time we’d taken a few steps the sunset had gotten better. This is my absolute favourite of the shots. Even when not shooting straight into the setting sun, the light was fantastic. Having shot a few sunset shots, I returned to photographing the people on the bridge. I also took a shot looking straight up at the support struts – admittedly something I only decided to do after seeing Catherine do it. I took another shot very similar to this, which was more central, but I preferred the lighting in this one and the single strut coming towards the camera and going out of focus. In a similar vein, we passed a boat with some great lights on it, that looked really nice as they moved out of focus. As we reached the other bank, I decided to have a go and some slower shutter shots of the movement of the people below. With shots like this it’s always difficult to judge just what is too blurry, but these are my favourites. I grabbed one last shot of the London Eye before we got off the bridge, a bridge which had proved to be quite fruitful. Back on the ground, we could return to more traditional London street scenes. Despite the great light, sometimes it was nice to shoot some of the darker corners, such as this side street I found as we made our way to Trafalgar Square. We got to Trafalgar Square, where some more photography could take place. I particularly like the colours of the London Underground logo. There’s something about the solid blocks of red and blue together I find pleasing. Which is partly where this shot came from; I like the diagonal line formed by the logo, then the streetlamp, and then the flag in the image, but I’m not wholly convinced by the the narrow depth of field. For whatever reason, the powers that be have chosen to use ‘No Entry’ signs to stop people from entering the fountains. It struck me as being a bit oddly worded, but I guess it must be the easiest sign to understand for non-English speakers. I quickly turned to photographing to people around the Square. Something we saw quite a lot of at Trafalgar Square was the infamous selfie stick. Whilst many see it as a pointless accessory for narcissists, my theory is it is a conspiracy against passing photographers who used to be able to take photographs of people at tourist hotspots, and technically become the copyright holder of one of a random stranger’s holiday photos. Our walk continued to Piccadilly Circus, somewhere I’ve actually never been to before, despite working in the middle of London for almost a decade and living in the suburbs my whole life. It gave me another opportunity to photograph an example of the London Underground logo, this time in the dark. I could also get the same with the famous advertising in the background. As a huge advertising space that tourists flock to look at I suspect it must cost quite a bit to advertise there. What got me was how well the adverts lit up the area where there was a crowd of tourists staring at it. And of course, there were more people with selfie sticks. We moved on again, passing into Soho. Some of the establishments we passed gave great opportunities for pictures, either of patrons or their empty premises. Catherine’s original idea when were were discussing this walk was to photograph some of the stage doors of the West End. Ironically I only ended up photographing one. I also find the shot works well enough as a monochrome HDR shot that it’s worth sharing both. Our stroll continued, and we soon found ourselves in Chinatown. The first thing we saw was a dimly lit alleyway, helpfully inhabited by a dark, shadowy figure. Much like the tail end of our last walk, we could see into the kitchens of some of the restaurants. A lot of the decorations were still up from Chinese New Year, which gave the place a splash of colour. Our increasingly circular wandering route meant that we kept popping in and out of Chinatown. On one such excursion I found this guy sitting outside a Pret a Manger by Leicester Square. Our return to Chinatown took us by even more eateries, making for some delectable photography. One place that caught my eye was a shop selling fish-shaped cream cakes. In the window was the automated machine they used to make the cakes. Sadly it was running on empty when we there; they must have had enough made already. I love photographing machinery like this. I love the industrial look and feel of them. We continued wandering around, taking in some of the sights on the periphery of Chinatown. Having clocked up quite a few miles, when we passed Leicester Square tube station for the third or fourth time we decided to call it a night and go our separate ways. I headed back towards Piccadilly Circus to meet my wife, and we headed into that tube station to head homewards. I’d already packed down my camera gear, but as we descended the escalator I took the opportunity to replicate some of the images that I’ve taken before on my iPhone. These next few images were shot with my 24-105mm lens, not my 50mm prime. I took my camera bag off my bag when we got on the tube. When I put it back on when we alighted a few stops later and realised just how much I ached already. The next day I was hurting a lot – my legs for walking eleven miles in a day, and my shoulder for carrying about three tons of camera gear. Next time I’ll be more realistic about how much kit I’ll carry with me. I’m really enjoying going on these walks with Catherine. Our next one is in only a couple of weeks, but I’m keen to turn this into at least a bimonthly thing. After all, London is a big place. I just love your constantly evolving themes and techniques. It makes every blog a joy. I loved the sunset shots, of course, but the last B&W tube shot has a very cool spiralness to it. Thanks! I’m think I’ve been able to capture how beautiful it looked on the day.